With the introduction of Europeans, along with their horses and firearms, buffalo herds were no longer were herds hunted for survival, but merely for sport. 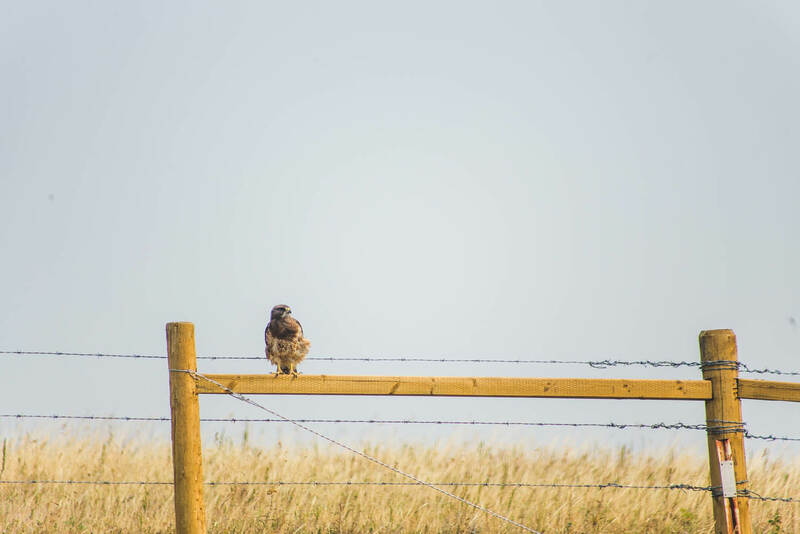 Where great herds, tens of thousands strong, once blanketed Alberta’s plains, their numbers soon dwindled and their hides turned into coats for the Canadian and American armies, as well as the North West Mounted Police. By the 1880s, buffalo were on the brink of extinction. 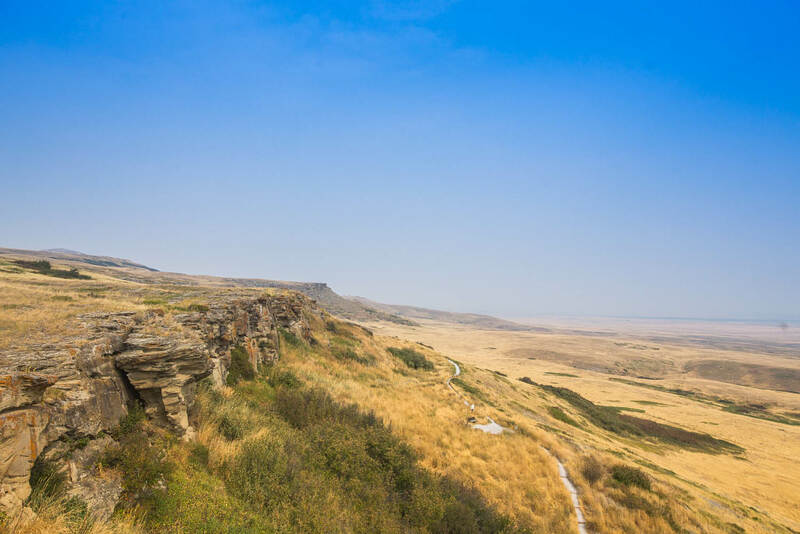 On the cusp of Alberta’s jagged Rocky Mountains and windswept prairies, 180 kilometres south of Calgary, you’ll find Head-Smashed-In Buffalo Jump. Thanks to its cultural and archeological significance, it was named a UNESCO World Heritage Site in 1981. Eeriness hangs in the air at Head-Smashed-In Buffalo Jump; this is, after all, where for thousands of years, the region’s Blackfoot people hunted buffalo (or bison) by chasing great herds over the precipice. For all its cultural, archeological and scientific significance, this landmark remains largely unknown to the masses of Canada, even more so to those of us visiting from abroad. A band of drummers thump their instruments while a flurry of dancers, young and old, caper across a dance circle, flaunting their feathers, bells, and tassels during the weekly dance ceremony at Head-Smashed-In Buffalo Jump Interpretive Centre. 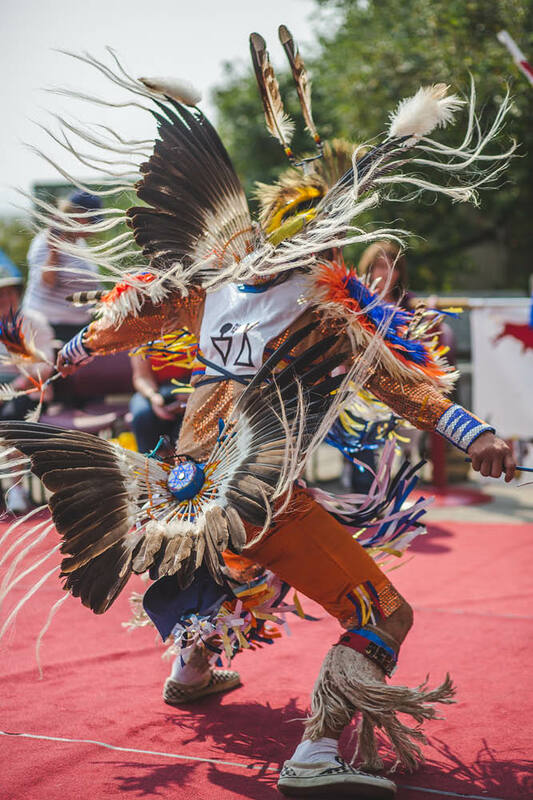 A young man in a feathery ensemble performs the ‘Old Style Chicken Dance’ at the weekly dance ceremony at Head-Smashed-In Buffalo Jump Interpretive Centre. The hunt itself involved much more than simply herding buffalo off a clifftop. It was calculated, strategic, and steeped in traditions. The herd had to be grazing in the right area, the winds had to be blowing in the right direction, the spiritual ceremonies had to be performed to perfection. If these conditions didn’t align, the Plains People would have to wait until next autumn to try again. While the golden plains that surround Head-Smashed-In Buffalo Jump are bare, ongoing efforts to conserve buffalo populations are slowly bringing them back from ‘threatened’ status. While the buffalo jumps may be long gone, their significance is not. What this gruesome UNESCO World Heritage Site lacks in international stardom, it makes up for in cultural, archeological and scientific intrigue, finds Alissa Jenkins. Dreamcatchers, teepees, bow-and-arrow wielding men on horseback…these are the associations many make with North American indigenous culture. And while all have their place, the horsemen didn’t take theirs until after European settlement. Thousands of years before horses stepped hoof onto North American soil, Canada’s First Nations people hunted on foot. While techniques varied as widely as the terrain, there was one particular hunting ground that was as much a feat in gore as it was in generations of ingenuity and precision. And with a name as gruesome as Head-Smashed-In Buffalo Jump, there are no prizes for guessing why. 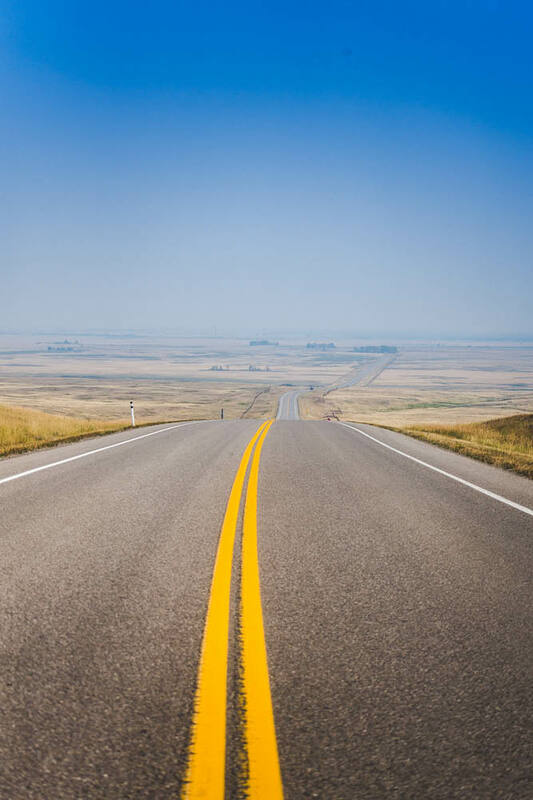 Arriving at the base of a cliff on the cusp of Alberta’s jagged Rocky Mountains and windswept prairies, 180 kilometres south of Calgary, a late summer breeze ruffles through golden plains. Eeriness hangs in the air; this is, after all, where for thousands of years, the region’s Blackfoot people hunted buffalo (or bison) by chasing great herds over the precipice. The unease is compounded by a faint drumming that builds louder and louder, reverberating in my chest as we follow a trail through the swaying grass, up the side of sandstone bluffs. At the top, a band of drummers thump their instruments while a flurry of dancers, young and old, caper across a dance circle, flaunting their feathers, bells and tassels. It turns out we’ve serendipitously timed our visit to coincide with the weekly dance ceremony at Head-Smashed-In Buffalo Jump Interpretive Centre. Brimming with pride and smiles, these Blackfoot descendants have travelled from all around the region to take part in the inter-tribal dance ceremony, setting a distinctly different tone to the somber one I’d expected. 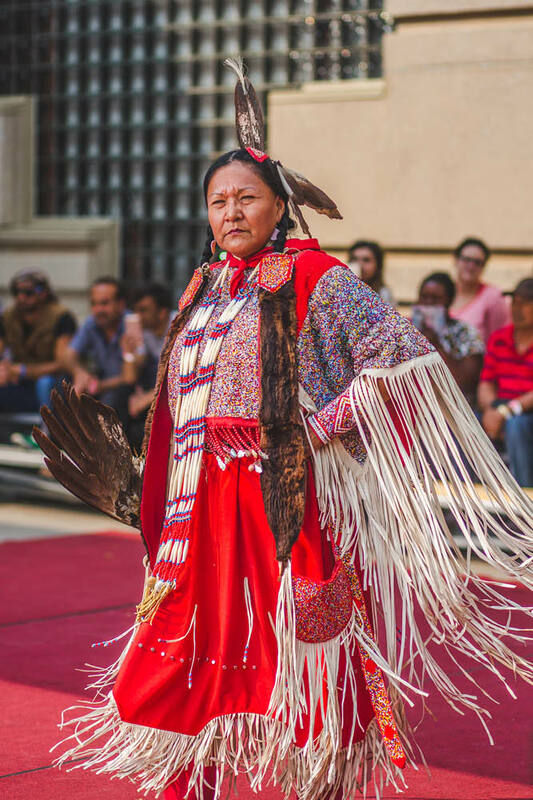 “This is what we call ‘Old Style Chicken Dance’, originating here in the Blackfoot nation,” announces the MC over a microphone, while a young man in a feathery ensemble demonstrates a routine of steps, hops and bops before a modest crowd. We quickly learn the macabre buffalo jump tradition was as much about bringing people together and cultural exchange as it was about a mass kill. In fact, so rich were the customs surrounding Head-Smashed-In Buffalo Jump, that this cliff was named a UNESCO World Heritage Site in 1981. But for all its cultural, archeological and scientific significance, it’s a landmark that remains largely unknown in Canada, and even more so to those of us visiting from abroad. 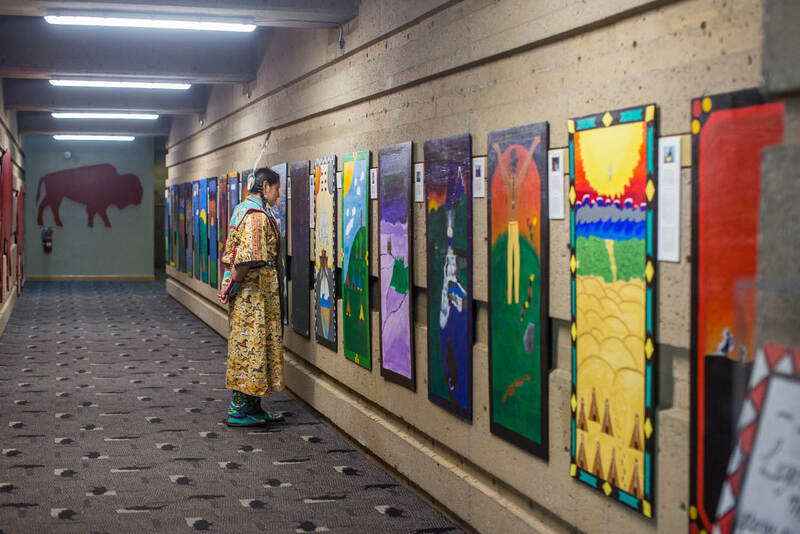 Wandering up and down the five-tier Interpretive Centre, past ancient artifacts and archeological displays, the story of the buffalo jump unravels as something much more than a barbaric hunting practice. Rewind 6000 years and it’s a social occasion that brings together First Nations bands from all over the region, spending the summer trading news and goods, making allegiances (and enemies), and arranging marriages. By the time autumn rolls around, the buffalo are in prime eating condition, the males have departed so the herd is calm, and the cooler weather means it takes longer for meat to spoil. By all accounts, it’s an ideal time to arrange a buffalo jump. 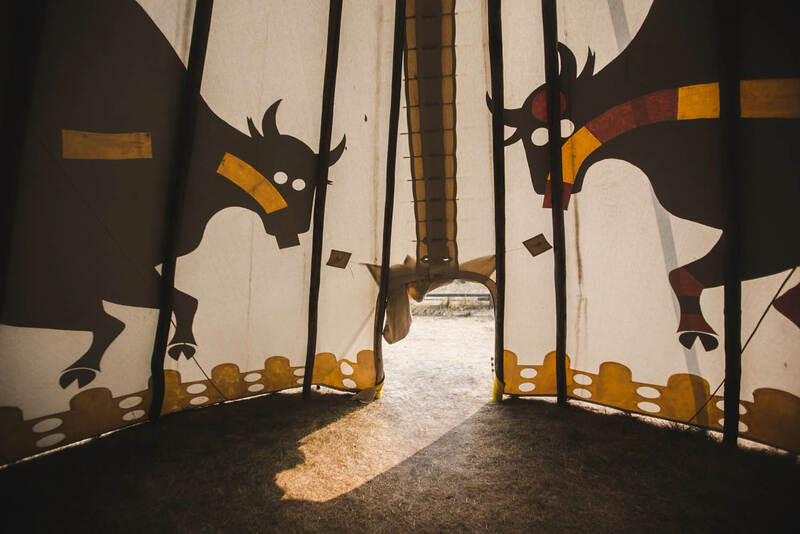 Steeped in traditions, the buffalo jump is calculated and strategic, shaped by centuries of analysing buffalo behaviour. A herd must be grazing in the right area, the winds must be blowing in the right direction, and the spiritual ceremonies must be performed to perfection. If these conditions don’t align, the Plains People will have to wait until next autumn to try again. Preparations entail building stone cairns, dressed in branches and buffalo droppings, to create a runway to funnel the herd over the cliff edge. Buffalo have poor vision so the cairns create the illusion of a solid wall, meaning the only way to run is forward. Catering to the buffalo’s exquisite sense of smell, hunters also drag buffalo skins down this runway to help guide them. Then comes the art of setting off a stampede. The camp elects a handful of skillful young men to participate in the hunt as runners; gently rounding up the herd and gradually positioning them within their readymade runway. Then a couple of runners disguised in buffalo calf skins mimic the bellow of a calf in distress, prompting the herd to instinctively move on and protect the young. Meanwhile other runners, dressed in wolf skins, approach from behind, panicking the herd into a stampede down the runway. Timing is everything though — an uncoordinated ‘spooking’ could mean the herd runs in the wrong direction or worse, a runner gets trampled. But if everything goes to plan, the buffalo stampede down the runway, the runners dodge the cliff edge by slipping behind a cairn at the last moment, and the momentum of the stampede carries the herd over a 20-metre cliff edge, with any survivors swiftly bludgeoned. Although the thought of hundreds of buffalo carcasses piled on top of one another is, for me, a grisly one, I take solace in the fact no fragment went unused. 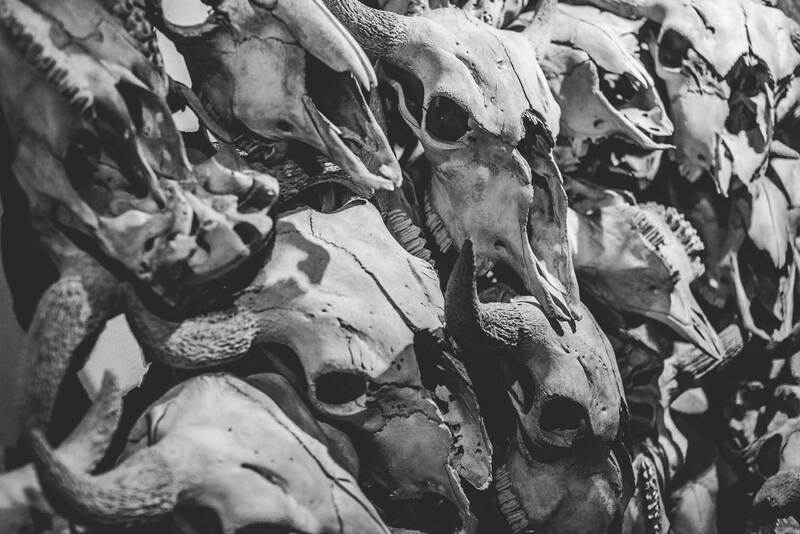 Bones were sharpened into tools and weapons, marrow was used for grease, skins were used for clothing and shelters, rawhide was used for sewing and binding, and bladder bags were used for storage. The meat, meanwhile, was dried and mixed with berries to make pemmican — a rich food source the Plains People survived on throughout Alberta’s brutal winters. Of course, this all changed with the introduction of Europeans, along with their horses and firearms. As ranchers and farmers pushed west throughout the late 1700s, the lifestyle of the Blackfoot people changed with the landscape, new strategies for survival were adopted, and the buffalo jumps were all but abandoned. Just as their traditions were curbed, so too were buffalo numbers. No longer were herds hunted for survival, but merely for sport. Where great herds, tens of thousands strong, once blanketed Alberta’s plains, their numbers soon dwindled and their hides turned into coats for the Canadian and American armies, as well as the North West Mounted Police. By the 1880s, buffalo were on the brink of extinction. Today, as we stand atop Head-Smashed-In Buffalo Jump, the golden plains that surround us are bare, but ongoing efforts to conserve buffalo populations are slowly bringing them back from ‘threatened’ status. While the buffalo jumps may be long gone, their significance is not. Head-Smashed-In Buffalo Jump is on Spring Point Road, 20km west of Fort Macleod, in southwestern Alberta. Open 10am to 5pm, seven days a week, the centre hosts regular events at various times of year from hiking to the historic clifftop cairns, dancing and drumming, as well as taking part in traditional blessings. Visit Alberta for details.